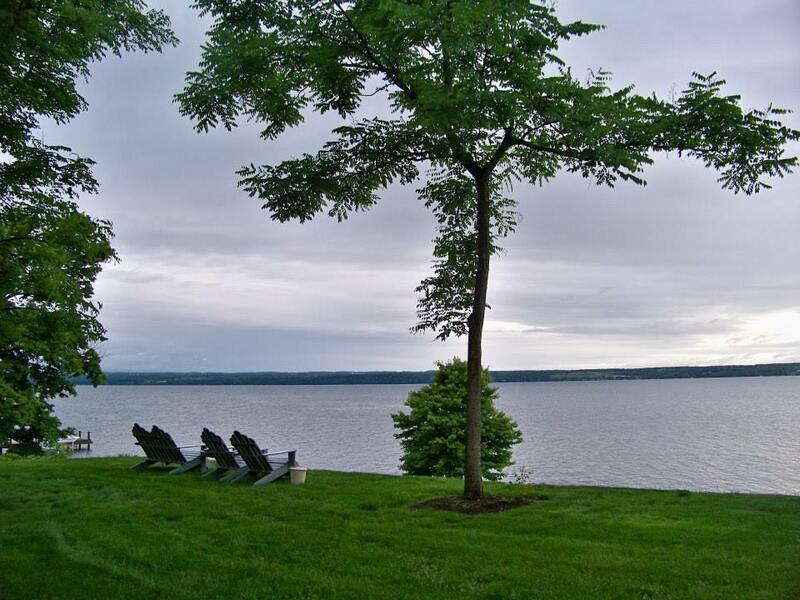 If you’re looking for somewhere new to visit this summer – whether it’s for a day, two days or a week – why not check out the village of Aurora, located along Cayuga Lake? It’s just about two hours from the city of Buffalo and about an hour outside of Rochester, NY. Going via the 90 from Buffalo to Aurora, the trip is just over two hours. However, we got over the 90 at Canandaigua and took the back roads (5, 20) to get to our destination instead, going through Canandaigua and Geneva en route to Aurora. Sure, it takes a little longer, but it’s a much more scenic route if you’ve got the time to spare. Before we reached our destination, we stopped at the MacKenzie-Childs house. Basically, MacKenzie-Childs is a furniture & decor store with all sorts of fun, unique prints and items that will really add to any household. The former home of the duo has been transformed into a showroom in Aurora, and the company offers tours of the house. Of course, after the 45-minute tour, it’s hard to visit the store and not want to buy everything in sight. Our bed & breakfast was the E.B. Morgan House, working with the Aurora Inn. Upon arrival, Dale, the innkeeper of the house, greeted us, carried our bags and always had a smile on his face. He gave us a tour of the house, offered dinner suggestions, and made us feel extremely welcome and respected. He served us wine and cheese before we left for dinner, and overall, he was a wonderful host – even calling the restaurant to change our reservation so we could stay at the house for wine and cheese. The house itself is beautiful. It’s a seven-room mansion located on the lake. The view from the back porch is astounding – that’s the photo at the top of this article – and the rooms are each unique but all equally gorgeous. The rest of the house is also breathtaking, from the piano room to the library and everywhere in between. Of course, the other part of the bed and breakfast is the breakfast. Dale served muffins and coffees/teas for a pre-breakfast, and we were able to walk over to the Aurora Inn – a three-minute walk – where breakfast is included. You simply bring your reservation card for the E.B. Morgan House, and your bill is taken care of. For dinner, we went to Pumpkin Hill Bistro. The restaurant is located in an old farmhouse, rustic and homely, and the food was wonderful. I won’t give away all their secrets, but the presentation of the dessert menu…. well, let’s just say it’s presented in a very unique manner. I had the chicken sandwich with kettle chips and a salad for dinner, with the chocolate mousse cups for dessert. The only word I can think of to properly describe it: scrumptious. The best part of all of this was, hands-down, the view. Being right on the lake… nothing can compare. On the way back home to Buffalo, we went around the rest of the lake, which took us down through Ithaca, then up the other side of the lake and back onto the 90. Finally, we stopped at the Montezuma Winery and Montezuma National Wildlife Refuge, both located in Seneca Falls, New York, before getting onto the Thruway and heading towards home. We’d make one final stop in Canandaigua to get lunch at Eddie O’Brien’s – a good restaurant that I’d recommend, by the way – before arriving back in the City of Good Neighbors early Friday evening. If you’d like to check out my photos from this trip, click here.